Hey guys! It’s that time of year, with the madness and the frenzied shopping and the food buying and the present wrapping and the lots-of-people, and the puddings and the aunties and the trees and the paper hats and the loads-of-films on television. Please Pin this to share with others! During busy Christmas parties or family gatherings, make sure your child has somewhere to go where they can be quiet by themselves. A spare bedroom or office is great to just give kids a retreat when the hustle and bustle gets too much- often leading to meltdowns. Try and arrange it so that your child can go and relax with a book or game or iPad when they want some time alone. 2. Appreciate your child’s way of expressing gratitude and avoid forcing “thank yous”. Children show gratitude in numerous ways- their lit-up faces when they see a gift they love, the shout of excitement, etc. We shouldn’t need a token phrase to know that, and we shouldn’t be giving in order to receive anything anyway. If there are relatives who will be really upset if they don’t get a ‘thank you’, coach your kids before-hand. “It would make Nana really happy if you said thank you as she really appreciates kind words”, or something along those lines, should suffice. If they are really shy, enthusiastically narrate and say thank you on the child’s behalf- “oh they love it, thank you so much!” and act as their partner to navigate the situation so that everyone’s needs are met. 3. Support your child’s decision not to sit on Santa’s lap. It isn’t cool for a child to be passed to a stranger against their will and it certainly isn’t ok to make someone sit on a stranger’s lap. It goes against everything we usually tell our children, it goes against their natural self-defence mechanisms and it is supposed to be FUN! Good rule for life: if it’s not fun for the other person, you have to stop. 4. Try to find alternatives to making your child go Christmas shopping with you. It’s not fair to put kids in front of all the endless toys and goodies that are on display at this time of year, especially not when they are bombarded with adverts that tell kids to ask their parents to buy them! It inevitable ends in disappointment and tears or ruined expectations. Christmas shopping is stressful enough without adding children to the mix! 5. Don’t threaten to take their presents away or ‘call Santa to tell him’ they’ve been ‘bad’. Children are not ‘bad’, and it’s not kind to proffer hope and excitement and then take it away according to your standards of behaviour. Children are not robots or performing monkeys (poor monkeys, too) to be rewarded according to our arbitrary standards. If you have an Elf on the Shelf, check out my post about the 4 things the Elf should NEVER do if you want a happy kid at Christmas. 6. Respect your child’s decision to eat or not eat any particular food. Christmas is a time of dining out and large social meals. Children shouldn’t be made to eat a food to save an adult’s feelings; their job is not to fulfil us emotionally or stroke our egos. Prepare by bringing food that you know your kids will like, and be honest with the host about what they do and don’t like. We go to great lengths to ensure that we make food that our adult guests will like and it’s good to show children the same respect. 7. Avoid talking about body size or diet. Christmas is when people sit around bemoaning the tightness of their waistbands; don’t be one of those people. Kids listen to everything and they pick up on the lack of control that adults have over their eating, and the faddy diets, and the emotional eating and insecurities about bodies and body image. Don’t comment on your body size, other people’s body size or the amount or type of food you eat, and certainly don’t talk about your child in this way. 8. Keep your child’s spiritual life in mind and prepare to nurture it. Children are not simply physical beings; they are emotional and spiritual and may want to explore the deeper meanings and messages behind Christmas and the season around it. Be open and facilitate learning about this if your child wants to. 9. Respect your child’s choice not to hug or kiss relatives or friends. Childhood is the crucial time to learn about bodily autonomy (read about an experience I had of sexual assault and what I did here), and an adult’s feelings are not as important as a child knowing that their body is theirs. If your child wants to they could offer an alternative such as shaking hands, a high-five or waving, or if they are shy and don’t want to interact then enthusiastically greet the person and meet the adult’s needs for attention yourself. I hope that’s helpful. As lovely and magical as Christmas can be, it can also be overwhelming (for both adults and children!) 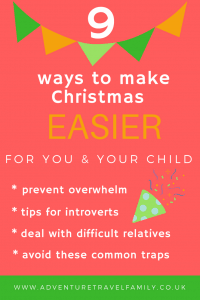 With a little thought, gentle parenting and preparation, we as parents can avoid situations that are super stressful for our kids, and in turn have a more joyful and peaceful Christmas season. For more tips to help your children stay calm and connected, as well as posts on specific issues such as sleep and screen time, click here. How To Deal With Temper Tantrums: 8 Simple Ideas That WORK. Did you know childreN’s taste buds develop as they grow? Their ‘tastes’ really do cHanGe! That means many green vegetables genUinely taste bitter to children! No wonder they usually say they dont like them huh?! If this was widely known, would parents still insist on a few mouthfuls, or might they find alternative Options?